We sold this beautiful TF a couple of years ago to an enthusiast in West Sussex and it has returned to us as he fancies a change. During his ownership he researched extensively into the car's past and uncovered an interesting early history. 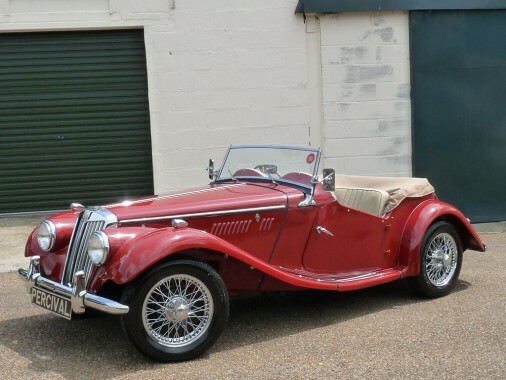 The MG then passed through a couple of owners until in 1989 it was acquired by the wife of a Syrian diplomat living in the UK and spent much of its time in storage. After thirteen years of ownership a gentleman in Plymouth purchased it who enjoyed it and eventually commisssioned a three year, body off restoration between 2009 and 2011 including a full engine rebuild all of which is documented in the history file. It has had two owners since. It has 1250cc engine with twin carburettors and a four speed gearbox. It has a beautiful new cream leather interior and carpets, new mohair weather gear in cream including the full tonneau. The chrome wire wheels complement the dark red bodywork. Recent works include an extensive brake overhaul and engine set up, new shock absorbers all round, new rear springs and bushes and a new front bumper and grill.